Everyone loves traditional appliqued quilts. Flowers, hearts, birds, leaves and vines can adorn traditional quilt blocks or large shapes can create a large contemporary landscape. 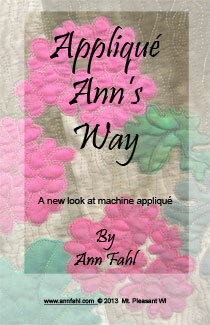 Appliqué is one of Ann's favorites because of its great flexiblity. It also provides an interesting contrast to the very geometric and angular lines of patchwork in the background. Not everyone likes to appliqué. Ann wants to change that, because there are so many different methods available to us today. 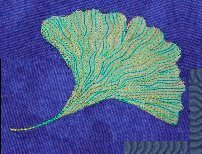 In Appliqué Ann's Way she shares her six favorite methods; all combine the sewing machine with fabric and fusing. You are sure to find one technique that appeals to you! She includes tips and problem solving ideas as well. Whether you are a beginner, experienced or in between, you will find something to help improve and refine your techniques, it just takes a little practice. Whatever your level of ability, there is a technique for you. There is a lot of information packed into this booklet. Ann shares many tips and ideas. Included is a color cover, 36 pages of instruction and black and white how-to photographs. 5.5" x 8.5" with stapled binding. This book is sold out. The information and images on this site are protected by copyright law. Permission of the artist is required for any business or commercial use. © 2019 Ann Fahl, Racine, WI.